Liechtenstein is the world's sixth-smallest country. Many visitors to Europe pass Liechtenstein right by, either because they are in a hurry to get to their destination or because they simply do not know where it is. While tiny, landlocked Liechtenstein takes a bit of time to get to because of its location, this country is worth a stop, even if you spend a just few hours there. If your itinerary takes you through eastern Switzerland or western Austria, consider a lunchtime visit. Enjoy a pleasant meal, then walk, shop, visit a museum or go for a short hike. Liechtenstein is sandwiched between Austria and Switzerland. The capital, Vaduz, is a short drive from Switzerland's N13 highway. The entire country is just 160 square kilometers (about 59 square miles) in area. Although Liechtenstein is small, it is quite beautiful. How Do I Get to Liechtenstein? You can drive to Liechtenstein via Germany, Switzerland or Austria. If you drive through Switzerland or Austria, you must purchase a toll sticker, called a vignette, for each country. Austria offers 10-day vignettes for 9 Euros, but you'll need to buy a one year vignette (currently 40 Swiss francs, approximately 35 Euros) if you drive through Switzerland. You cannot fly directly to Liechtenstein – there is no airport – but you can fly to Zürich or St. Gallen-Altenrhein, Switzerland, or Friedrichshafen, Germany. You can take the train from Austria to Schaan-Vaduz station, Liechtenstein, and from Switzerland to Buchs or Sargans (both in Switzerland). From any of these stations, you can reach other cities in Liechtenstein by bus. Liechtenstein offers many attractions and activities. The capital, Vaduz, has a beautiful main square with many works of public art. In the summer months, you can take the whimsical Citytrain tour of Vaduz; this narrated tour shows you the highlights of the city, including stunning views of the mountains and of the exterior of Vaduz Castle, the Reigning Prince's residence. You can also visit the Liechtenstein Center and the Reigning Prince's wine cellars (Hofkellerei). If bling is your thing, stop by the Treasure Chamber of the Principality of Liechtenstein and feast your eyes on crowns, jewels, and moon rocks. 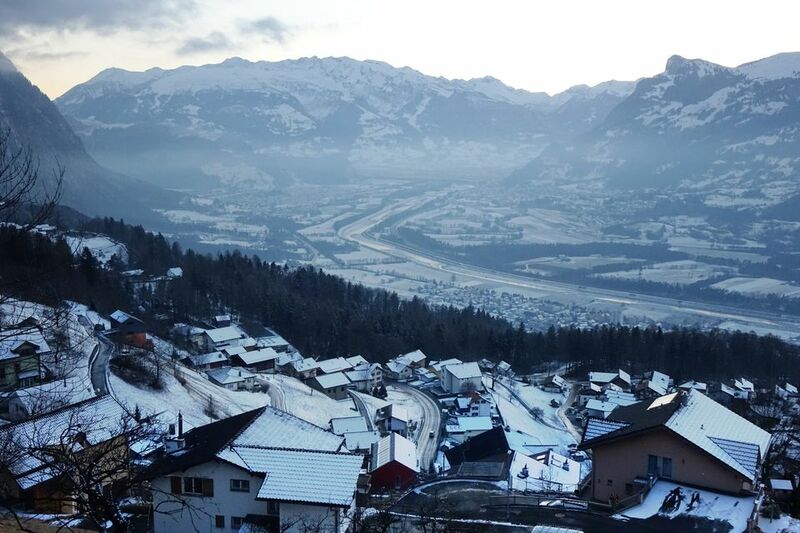 Outdoor activities abound in Liechtenstein; head to Malbun for winter skiing and summer mountain biking and hiking. Triesenberg-Malbun features a scenic chairlift and the Galina Falcon Center. Wherever you go, you can walk, bicycle or just sit and watch the world go by. It can be difficult to find detailed travel information about Liechtenstein because the country is so small. Liechtenstein's official tourism website has pages covering a variety of travel topics, including attractions, accommodations, and transportation. Liechtenstein's climate is continental. Expect snow in the winter and carry snow chains if you drive during that season. Be prepared for rain during the remainder of the year. Liechtenstein does not have its own currency. Prices are listed in Swiss francs, which are available from ATMs. The parking lot kiosk in the lot in the center of Vaduz takes Euro coins. Some attractions, such as the Citytrain in Vaduz, accept Euros. Liechtenstein is known for its beautiful postage stamps. You can see examples of them in the Postage Stamp Museum in Vaduz. This museum does not have an admission charge, so you can visit for just a short time without worrying about the cost. The Liechtenstein Center in Vaduz sells postage stamps. Liechtenstein is a prosperous country with a flourishing financial services industry. Lodging and meal prices reflect this. Most restaurants include a service charge on guest checks. You may add a small tip if you wish, but the service charge is sufficient. The crime rate in Liechtenstein is low, but you should guard against petty theft and pickpocketing, just as you would in any other place. Smoking is prohibited in restaurants, although smoking sections are permitted. If cigarette smoke bothers you or may affect your health, ask about the smoking policy before you sit down at a restaurant table. You can get your passport stamped at a tourist office for a small fee. Although you can hike up to Vaduz Castle, you cannot tour it; the Reigning Prince lives there with his family and the castle is closed to the public.